Loyal embodies a traditional Craftsman profile, but in a simplified, more modern interpretation. Building upon the rich history of this tradition, Loyal is ideal for today's homes featuring bungalow and lodge-style architecture. Seeded glass panels are polished on the exterior for easy maintenance while an etched interior finish provides excellent diffusion for the included energy-efficient bulb. Loyal features a cast aluminum housing with a durable powder coated finish. Authentic mission styling with warm honey coloured art glass with mica accents. Impressively scaled solid cast frame with intricate geometric details. In the Dibs collection, modernist architecture merges with Arts and Crafts sensibility. A visually striking metal frame contrasts with an etched, cubic form glass shade that provides pleasing illumination. A durable powder coat finish in a warm bronze tone provides the finishing touch. The one-light large cord hung pendant/outdoor hanging lantern from the District Collection features metal shade that offers an industrial-inspired design. Available in incandescent and LED versions and are dark sky compliant. The versatile vintage form can be used in indoor and outdoor applications. Welcome your guests with an architectural inspired light that features a modern profile and an etched glass diffuser. Constructed of durable materials for years of enjoyment. The frosted glass diffuser is a great option for both traditional light bulbs or newer energy efficient light sources. Open bottom design allows for easy access to change bulb. Loyal Collection 1-Light Antique Bronze Hanging Lantern Loyal embodies a traditional Craftsman profile, but in a simplified, more modern interpretation. Building upon the rich history of this tradition, Loyal is ideal for today's homes featuring bungalow and lodge-style architecture. Seeded glass panels are polished on the exterior for easy maintenance while an etched interior finish provides excellent diffusion for the included energy-efficient bulb. Loyal features a cast aluminum housing with a durable powder coated finish. 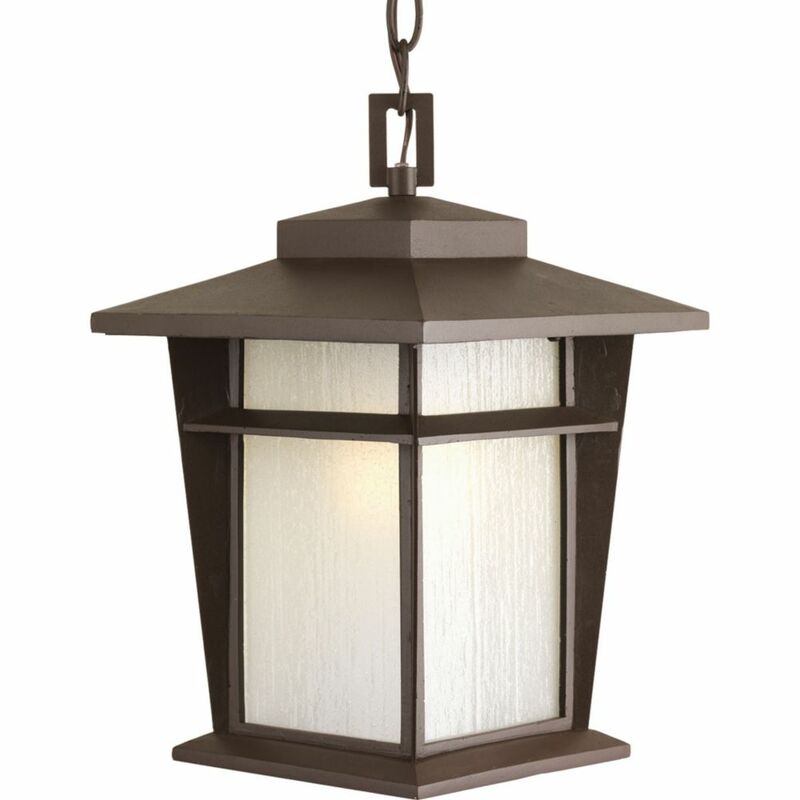 Loyal Collection 1-Light Antique Bronze Hanging Lantern is rated 4.5 out of 5 by 2. Rated 4 out of 5 by Fishman from Good quality light that gives off an ample supply of soft light. The chain is difficult to cut a... Good quality light that gives off an ample supply of soft light. The chain is difficult to cut and bend to hang the light or would having given it 5 stars. Rated 5 out of 5 by Stephanie from The lamp was perfect in size and assembling was super... The lamp was perfect in size and assembling was super easy.